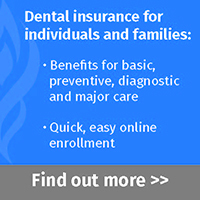 Dental insurance products available in a number of different plan designs. Insurance plans offering affordable coverage with instant free online quotes, coverage for individuals 18+ (including seniors), no online enrollment fees and a 30 day customer satisfaction guarantee. With Traditional-style Plans from Delta Dental, you get the same kind of dependable dental benefits offered by employee group plans. We're America's leading dental benefits company with plans that provide comprehensive, prevention-based dental insurance coverage to more than 60 million people nationwide. - Up to 100% coverage available on select dental plans for preventive services. - Twice yearly exams and cleanings. - Freedom to see any dentist you want in our extensive network. - Competitive rates with automatic monthly payments. - No waiting periods when transferring over from another qualifying group dental plan. Choices: Many plans to choose from based on your needs and budget. Dentist: See network dentists or ANY dentist with an insurance plan, it’s your choice. Nationwide Dental Network: Plans provide access to nationwide dental networks. Discounts on many procedures including cleanings, fillings, braces, crowns and more. Thousands of satisfied members nationwide. A managed dental plan that arranges for comprehensive dental services through their contracted panel of dentists conveniently located throughout Colorado.